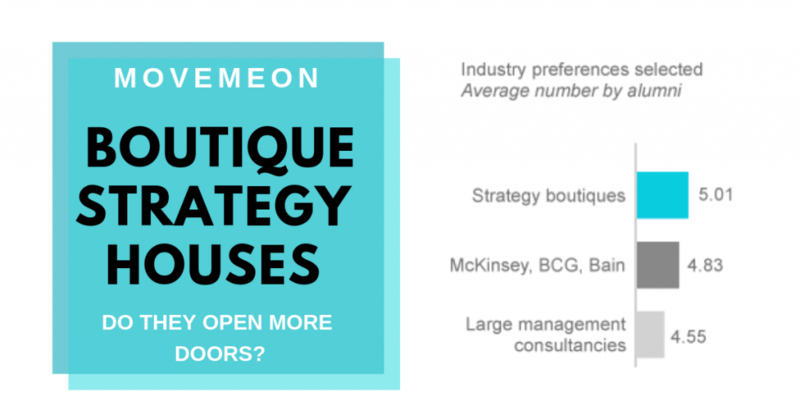 Do boutique strategy houses open more doors? Back in 2016, we ran a poll on “why enter strategy consulting”. We were intrigued to see the main reason was “to open doors”: to have more opportunities in different industries when you leave. This is understandably very appealing for top graduates who aren’t yet sure what they want to do in their career. In this article, we start by looking at the results from the “why enter consulting” poll. Given the importance of “opening doors” (transferable skills, multiple industry exposures and prestige on the CV), we then go through the analysis of which consultancies were best at providing this. Based on the preferences of over 20,000 ex-consultants on the platform, we were interested to find out it wasn’t the most prestigious brands that were “opening doors to most industries”. We look into the probable causes of this, followed by a short conclusion on how you can increase the breadth of your appeal across industries. WHY START YOUR CAREER IN STRATEGY CONSULTANCY? When we posed the question “why did you enter strategy consulting” to our members, the overwhelming answer was to have more opportunities when you leave. All three of the top responses were actually about the future jobs they could get, as opposed to the current role they have! BUT WHICH CONSULTANCIES GIVE THE BROADEST EXPERIENCE? Of the three most popular reasons people enter strategy consultancy (transferable skills, prestige on CV and multiple industry exposures), transferable skills and prestige have been well documented. We’ve seen countless “prestige lists”, and from our experience, we’ve found the skill-sets of consultants to be extremely comparable between consultancies. As such, we wanted to dig into the question of which consultancy opens doors to the most industries. To analyse this, we looked at the preferences of our 20,000 strong community. We then analysed, by a consultancy firm, the number of different industries consultants were looking for jobs in. Whilst we were expecting to see the largest firms to drive the most choice, it was, in fact, the opposite. Not only were the large consulting firms resulting in narrower industry experience, but also the smaller boutiques were outperforming the most prestigious strategy firms. We identified three potential drivers behind these trends: the type of work; the need to specialise; and larger firms being limited to certain industries as a result of larger fees. Every company needs a strategy. Whether it’s how to take advantage of growth opportunities or increasing profitability: all companies, no matter the industry, are following a strategy. As such, strategy consulting can be very broad, and relevant to all industries The work at larger consultancies can be much more specialized. For example, lean and operations is only relevant to certain industries. The same goes for Big data/ analytics, for example. One big difference between consultancies is the rate at which you are expected to specialise. In McKinsey, we were encouraged to work across a broad number of industries as a “generalist”, for the first four years. It was only at the Manager level, where people started to consider where their industry “platform” was going to be. This was very different from my colleagues in some of the larger consultancies, who were specialising in various functions/ industries within a matter of months. This specialism question might also go some part of the way in understanding the difference between McKinsey, BCG & Bain and the smaller strategy boutiques (LEK, OC&C). Given the smaller size of the strategy boutiques, there is less of an expectation to specialise. Whilst managers will typically have industries and functional areas they work commonly in, the size of the consultancy will result in less of a need for specialisation. It’s no surprise that the prestigious brands charge higher fees. As a result, only businesses of a certain size (and often profitability), are able to afford to bring in the most well-known brands. Given this, the potential variety of industries you’ll be able to consult with will diminish with the increased prestige of the consulting brand. GREAT, BUT HOW CAN I BROADEN MY APPEAL? The most common reason for hiring managers not progressing candidates to interview is lack of industry fit. Time and time again, we hear from employers that there are no relevant projects in their given industry. As such, the importance of varied industry experience shouldn’t be underestimated. Our advice for candidates looking to increase their appeal is two-fold: – Firstly, make sure you’re putting your best foot forward. Have you tailored your CV with all relevant projects at the top? If not, chances are you won’t be progressing to interview (no matter which consultancy you worked at). – Secondly, if you really don’t have relevant industry experience, can you call out your relevant functional experience. As discussed above, the skills developed in consultancy are extremely comparable. Employers are often looking for the same skills (analytics, insight, stakeholder management). So if you can’t boast many projects in the relevant industry, make sure you explain your relevant functional experience/ skills on your CV. Freelance day rates - what percent are you receiving? At what point is it best to leave consulting? How can we get more women to apply for jobs?